A Tom Colicchio restaurant in the Alexandria Center, Riverpark is an elegant space with a unique menu with plays on the classics. We love the stunning extended terrace overlooking the East River, and recommend visiting while the weather is still warm. Riverpark has its own garden outside where many ingredients such as their peppers are grown. Reservations are accepted for parties of two or more. Riverpark is open on Labor Day Monday. 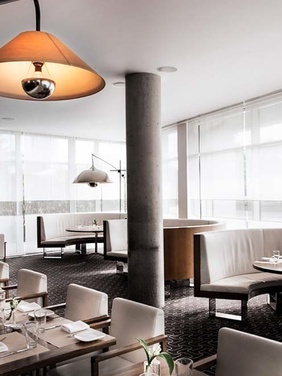 A very classy brunch spot located at the most western part of the West Village, this Jean-Georges restaurant is a great place to celebrate special occasions with a sophisticated and upscale vibe. The service is always first class, and you can't beat the Hudson River views. Take a stroll across the street after brunch. The $28 prix fixe is one heck of a deal for a Jean-George restaurant, and includes a choice of appetizer, entree, and dessert. Start by sharing the Tasmanian Sea Trout Sashimi. For your entrees, the classics like buttermilk pancakes, crispy French toast and a great eggs benedict are available, as is a Yellowfin Tuna Burger. Don't worry, this uber-classy spot does have a Bacon Cheddar Cheeseburger with Russian dressing waiting for those of you who want to really celebrate this American Labor Day. Perry Street makes their own fresh sodas in varieties like Lemon-Thyme and Hibiscus. We also love the sweet Raspberry-Lychee Bellini. Reservations are accepted for parties of two or more. Perry Street is also open on Labor Day Monday.